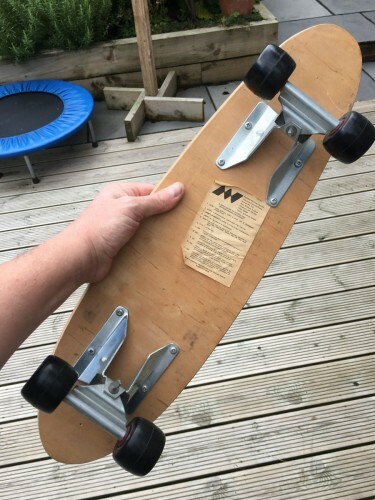 A kid in the UK in 1977 into skateboarding probably had one of these, it’s a Surf Flyer. 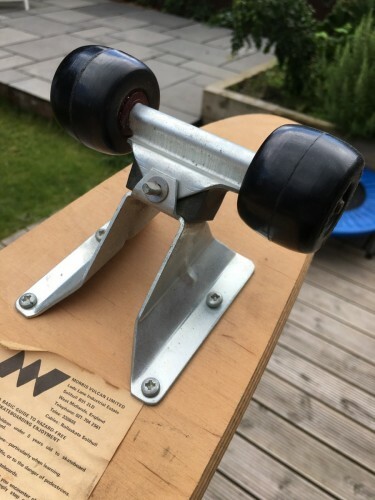 Mass produced and the most readily available skateboard available in the UK at that time. Pretty much a copy of the Warwick Bullet from the 60’s and were made by an enterprising chap from Solihull named Derek Morris. Mr Morris either had great foresight or was just lucky with his timing as these were everywhere when the craze hit hard. Made with blue, green and red graphics, some had a rear brake of sorts. 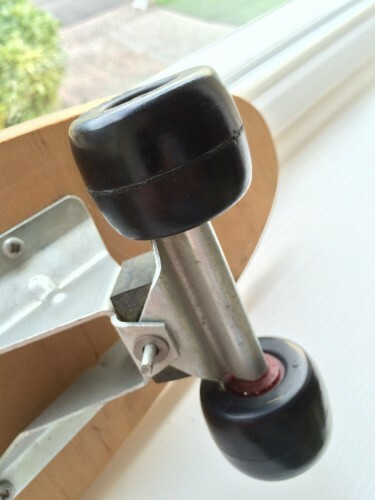 They had rubber wheels, loose noisey bearings and primitive pressed steel trucks. The deck was just a piece of Birch plywood but it was tough. It wouldn’t break if your dad jumped on it. That was one of recommended parental checks of the time prior to purchase. To top it all off they were slow, didn’t turn and were generally derided but loved all at the same time. Despite all that they gave many kids their first taste of the world of skateboarding. It was for some the first step into a bigger world. There was even a picture of “Mad” Mark Baker doing a frontside air in the pool at Brighton Barn skatepark on one. God knows how but he deserved that nickname. I got this example from EBay about 10 years ago for the princely sum of £15. 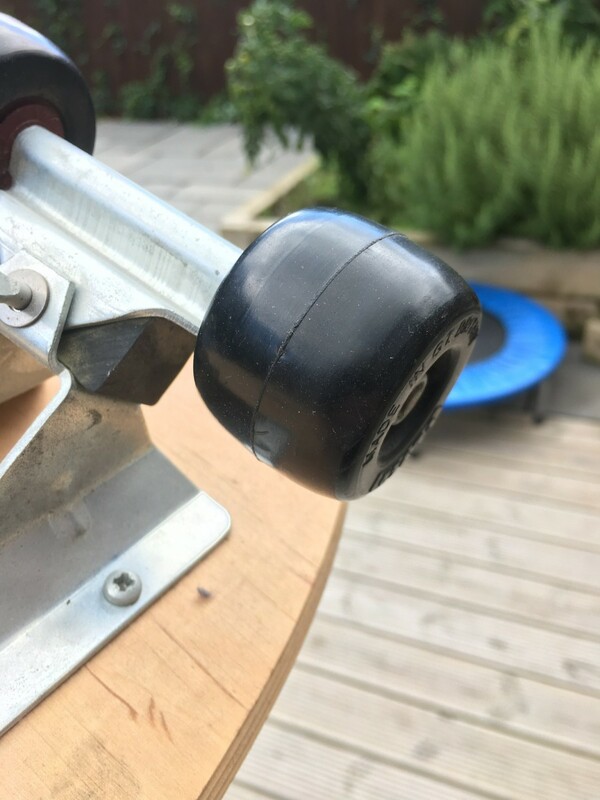 The rubber wheels are still shiny and never rolled on and the deck still has the gummed on Morris Vulcan paper sticker. It’s a bit dusty from storage but apart from that it’s perfect. 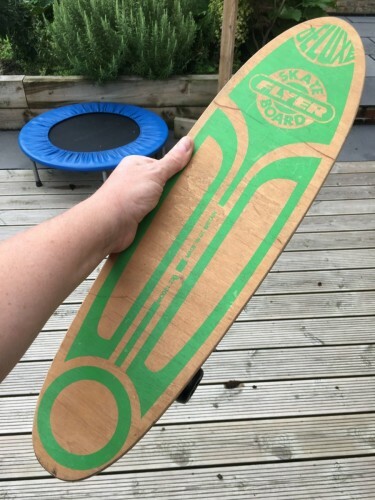 I never had one of these back in the day, my first board was a blue fibreglass Skuda. I do have one now though. As an update I have made my own updated version here.